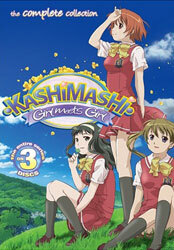 The Anime Archivist: Video Backlog: "Kashimashi: Girl Meets Girl"
“Kannazuki no Miko” piqued my interest in the Yuri genre a couple years back so I bought up as much as I could. This title isn’t typical of the genre though. Hazumu Osaragi is quite feminine male high schooler who ends up being reconstructed into a girl when he is accidently killed by a passing alien craft. While naturally there is some interest in the media about his/her predicament, things soon settle down. However things hot up between yamato neadesiko Yasuna Kamiizumi, who previously rejected Hazumu when she was a boy, and Tomari Kurusu, Hazumu’s athletic tomboy childhood friend, who has always had an interest in him and made a promise to be his bride. The major problem I had with this show is that for the first few episodes it really didn’t seem to know if it wanted to be screwball high school comedy or a melodramatic yuri drama. In the end it was the latter with a little sprinkling of the former. Natually I preferred melodramatic yuri drama. It was the much more satisfying element of the show. The inclusion of the aliens, a man named Hitoshi, becomes a teacher at the school and doesn’t add much at all, but his whole reason for being is explained away by the fact he’s researching the girl’s relationships to save his home planet’s people. The alien ship’s computer, an annoyingly energetic bimbo called Jan Puu adds nothing at all to the show. Neither does the inclusion of a teacher, Namiko Tsuki, who does nothing except try to woo Hitoshi and fall over a lot. Hazumu’s male friend, Asuta Soro, is a great inclusion providing a lot of humour as he is a bit confused if he should seduce her or keep the friendship before he became a she. It was rather interesting that immediately after Hazumu became a girl, she was told to behave like a girl. The anime glossed over this but I think it was a real wasted opportunity to explore some gender issues. Yeah right, like that stuff would be explored in a show like this… As I understand it, the original manga’s ending was much more dramatic. The ending OVA (episode 13) is a bit of a cop out, but ends quite nicely. It’s probably not the best the genre has to offer, but it mostly a fun ride. I do wish the focus had been entirely on the girl’s relationships only, and the slapstick humour removed. 6.5 out of 10.